Whoever said big vehicles cannot be cool has never seen this one! The Volkswagen Caddy Maxi is big, well made, and surprisingly good to drive. It seats seven easily and still has room to store everything you need. 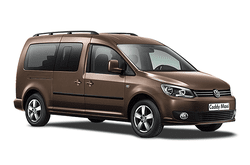 Whether you are looking for a vehicle for a family vacation or need something for a business conference carpool or any other situation where you have a lot of people riding with you, the VW Caddy Maxi is the answer! The unique design of the interior is spacious and comfortable and has all the latest customization options drivers, like you, want! Get yours today and see the difference for yourself!